Evenin', folks. So, it's been a while, but things are slowing down. There have been 59 new positions posted on the ACS Careers website. There are 12 academically-oriented positions (20%) and there are 37 (63%) positions from our friends at Kelly Scientific Resources. Good hands with Goodyear? : Goodyear is looking for a PhD materials scientist. Sounds like fun, and you'd get free tires, no doubt. More consumer products! : Bausch and Lomb is looking for a MS (experienced) or PhD (less so) formulator for its lens care division. Cool. And one for the organic chemists: Polysciences, Inc. (Bucks County, PA) is searching for an experienced synthetic organic chemist to work on specialty chemical manufacturing, specifically polymers. Kelly Time! : One last time this year, with feeling. Are you a chemist? Do you like chemistry? Kelly Scientific Resources would like to know if you would like to be an animal handler, a glassware technician (high school degree required!) or a food quality control technician. Good morning! There are 73 new positions up on the ACS Careers website; of those, 15 (21%) are from academia and 47 (64%) are from our friends at Kelly Scientific Resources. Better than it sounds: MEMC is looking for a "cleaning scientist". Bad titling, I think -- they're really looking for a M.S. surface chemist for developing new cleaning technologies. A worthy challenge: Materia (the Grubbs' catalyst people) is looking for a market development head. Sounds like fun, and a chance to make a lot of money. Good luck. Finding the peaks: Waters is looking for a PhD chemist to work on new products for separation science; sol-gel and materials experience is highly desired. Kelly Time! : Not much objectionable, but still: why would you look for a microbiologist, a food tech or someone with a degree in nursing? One of the most painful things about markets is that they often make fools of our fathers: Sharp operators with an eye for trends often outperform those who carefully learn a trade and continue a tradition." It is difficult to arrive at a more succinct description of my desires as a synthetic organic chemist: to carefully learn a trade and continue a tradition. Let us hope that the markets are kind to all of us. Good evenin', folks. From December 4 through December 11, there have been 149 positions advertised in the ACS Careers database. Of those, 26 (17%) are connected to academia, while 74 (50%) are from our friends at Kelly Scientific Resources. Adventures in searching: Pfizer's Cambridge site has been searching for members of their oligonucleotide team for a long, long time. I've commented on this before, and looks like they're looking to round out the team with a BS/MS-level oligo chemist and a postdoc in the same group. Good news for those folks. Neat! : SiPix is looking for an adhesives chemist to look for people to work on the new field of electronic paper. Uh, wow -- sounds futuristic. Kelly Time! : Oh, our friends at KSR are back to their old, stupid tricks. Are you a chemist? Do you like chemistry? Kelly Scientific would like to know if you'd like to be a microbiologist, an animal care technician or if you're a slightly used chemist. Ugh. The worst ad of the year: Wuxi AppTec is one of the leading outsourcing companies in China, if I'm not mistaken. In this week's issue, there's a slightly-larger-than-quarter-panel ad for director-level positions. In 18-point font, a banner reading "WuXi AppTec is Hiring Talents". Not in copy editing, I see. In addition, there's the bottom tagline "WE ARE DETERMINED TO SERVE YOU BETTER", which is a bit of an ominous statement. Small college of the week: The University of Wisconsin - Superior (Superior, Wisconsin, student population: 2,800 - SA-LUTE!) is looking for a tenure-track profession in analytical chemistry. You'd be asked to teach a class in the "Chemistry of Natural Waters", which would be a good thing, considering the town is on Lake Superior. If you love the idea of living on one of the Great Lakes (and who wouldn't? ), this might be for you. What will 2010 be like in terms of chemist employment? I think we can pretty safely say that 2008 wasn't so great and 2009 stunk. Answer in the new poll on the left! (and in the comments, if so desired.) Your bold predictions will be saved for internet posterity! On Friday, the latest unemployment statistics came out from the Bureau of Labor Statistics. It showed that the official (U3) employment rate for November was 10%, which is lower than the 10.2% reported for October. In addition, the broadest definition of unemployment (U6) was also down from 17.5% in October to 17.2% in November. It's rather difficult to tell what's a statistical blip and what's a trend. If you clicked on that last link, the displayed graph (above) of job losses appears to argue that losses peaked in January of 2009 and are now (relatively) close to zero. I don't claim to understand the cyclical nature of unemployment, but the potential trend is positive. Unfortunately for the unemployed (including unemployed chemists), I am unaware of any reports of significant increases in job creation. Furthermore, most economists foresee relatively high unemployment for 2010 and this report from Goldman Sachs' economists indicate that they expect unemployment to peak at 10.75% in mid-2011. For all our sakes, let's hope Goldman is dead wrong on that one. Well: One lousy ad for a microbiologist. There is that whole Christmas thing to consider; things get slow around then. But if you're thinking about being a professor...: Still lots of ads. Is anyone having any luck obtaining anything? Sprechen zie Deutsch? : Something called "Universitat Tubingen" (the University of Tubingen, I imagine) put a big ol' quarter-panel ad in this week's issue entirely in German. While I'm sure that it was appropriately aimed at all the German grad students and postdocs in the US, it was a little weird. Best of luck to candidates for the "Professur fur Analytische Chemie" position, which has something to do with "Chemo- und Biosensorik." Your stimulus dollars at work: If I had a penny for every ad looking for professors to work in areas like energy, renewable energy or superawesomesunnygreen energy, I'd be a rich fella. Good luck to these folks who get these positions -- either this will be a trend that will fade like feathered hair or we'll all be driving solar-powered Priuses in ten years. Small college of the week: The College of Mount Saint Vincent (Riverdale, NY, student population: 1,927 - SA-LUTE!) is looking for a physical chemist. If you want to teach college in the Bronx, this might be for you! Evenin', folks! From November 28 until December 3, there have been 33 new jobs posted on the ACS Careers database. Of these positions, 12 (36%) are academically related and none are from our buddies at Kelly Scientific Resources. Hmph: WuXi makes a push for experienced group leader level positions. Good luck to the unemployed soon-to-be sea turtles out there. Genentech's fishing for young Ph.D. bench med chemist resumes again. Think ink: Quad/Graphics is looking for a B.S.-level chemist with lots of experience with ink R&D. This is one of those niche fields that I know nothing about, but it sounds interesting. And so well-defended, too! : The US Mint's West Point, NY division is looking for a chemist to analyze metals for coinage. Dude, I can't figure out what educational level they want -- when will the US government realize that their ads are unreadable? Chemjobber is terribly pleased to have secured an interview with a recently hired chemistry professor. "SK" is an assistant professor at a small and very well-regarded private college who was kind enough to answer questions about applying for, interviewing and getting an assistant professorship and life at the front of the classroom. This e-mail Q&A was edited lightly by CJ and checked for accuracy by SK. CJ: Can you describe the process for finding your current position? What did you like about it? What didn't you like about it? SK: I was still committed to another year at my postdoc, so I almost didn't apply, but there were three schools with job listings that appealed to me (right location; right type of school), so I applied to those three. The application was similar to at an R1 institution, (cover letter, CV, transcripts, research proposals, letters of recommendation), with the addition of a teaching statement. I was fortunate to get interviews at all three institutions, which were 1-2 day affairs. At each school, the visit included meetings with members of the faculty, current students in the department, a meeting with the dean of faculty, and a talk on my research. Some of the interviews also included a meeting with the college president and/or a mock lecture on a specified topic. I was extremely fortunate to receive two offers (at my favorite two schools), and I negotiated with the respective deans regarding salary, startup funds and start date, before accepting an offer at my current institution. I'm having a hard time thinking of things I didn't like about the interview process, although it was a bit grueling. I guess there were a couple of 'weird' experiences on one of the interviews that might be worth mentioning. One was a conversation with a faculty member who seemed to have made up his mind before I arrived that I wasn't going to get the job. Towards the end of our meeting (during which I felt I had answered some tough questions quite competently), he said, "I'm sure you'll get an offer somewhere," which sounded suspiciously like, "you are qualified for this job, but I won't approve your hire." At the same school (let's call it University Y), I had a student snidely tell me, "People who can't get into X College go to University Y, and people who can't get into University Y go to Z University." By this point in the conversation, the student knew both (a) that I was next interviewing at X College, and (b) that Z University was my alma mater. So he managed to insult me, unfavorably compare his college to another that would make me an offer, and affirm my prior impression that students from University Y were obnoxious brats! Do you have former classmates/colleagues who have found academic positions at more research-oriented institutions? How are your experiences different? I do have several friends who have gone that route. From what I can tell, it seems to me that their pressures are very similar, though their order of priorities are a bit different. We all seem to want to do a good job of teaching, to manage our research groups effectively, and to secure external grant funding. For me, that list is roughly in order of decreasing importance. For my friends at R1 institutions, the order of importance seems to be reversed. Our resources at our respective institutions also seems a bit different. My friends at R1 institutions received copious financial support in the form of startup funds (in one case amounting to about 10 times what I received). That said, it seems that my institution is far more generous in terms of mentoring and general guidance to help me be successful. For example, my department teamed up to write a joint grant to purchase an expensive piece of equipment for my research program. (If you count the cost of this equipment, for which I will be the primary user, then the startup discrepancy with my most well-funded friend in a research position drops from 10x to 4x). It is also apparent that the assumption at my institution is that most faculty hires WILL get tenure. That is in stark contrast to one friend of mine at a major research university, who was told that only a quarter of hires like him will receive tenure. Can you tell me about a typical day, now that you're a professor? What's it like to be on the other side? It's hard to decide what a typical day is, so I think I'll just describe my day today. This morning I arrived at work at around 7:15 am. I checked my email, put the finishing touches on my lecture slides (which I finished tweaking around 11pm last night), gathered the handouts I printed yesterday, and made my way down to the lecture hall for class. I taught two back-to-back, one-hour sections of General Chemistry, then returned to my office to respond to some emails and modify my lecture slides to post on the course website. At 11am, I had a department meeting where we discussed the progress of our current faculty search. At noon I met with my research group (which consists of 3 senior thesis students) to check in on their lab progress over the last couple of weeks. During the meeting, I stole glances at my email to see if I had heard back from the funding agency that was supposed to announce their decision on my grant application application in "mid November"... Then I headed over to the dining hall at 12:30 to catch the last half of the monthly Junior Faculty lunch meeting, where we learned about the college's current development campaign. At 1pm I scrambled back to my office to meet with a student who had done poorly on the first quiz in Gen Chem. Then I helped my research student set up a nitrogen tank in the lab before meeting with more Gen Chem students during my office hours from 2-4. At 4pm I had a phone conference with a representative from an online learning site who wants me to promote his product to students in my organic chemistry class next semester. At 5:00, I logged into the college's Academic Advisory site to send notices to students at risk of failing General Chemistry. For the last hour, I've been working through my inbox to reply to assorted emails (like this one) before going home for dinner. Have you taught your first class? What has that been like? I've been teaching General Chemistry for the last few weeks. It is equal parts terrifying and delightful. My students are absurdly smart, and are constantly asking me questions that test my knowledge of the subject matter. I'm also spoiled in the sense that my students are, by and large, interested in chemistry and willing to engage in the material and participate in class, which makes teaching them a joy. The hardest part for me has been dealing with the different backgrounds of my students. Some have taken AP Chemistry and know everything that I'm teaching, while others have a much weaker high school background. It's virtually impossible to satisfy everyone, so I've been trying to take regular readings of the class to get an idea of what things people are struggling with, or also what sort of higher-level enrichment-type questions they might have that I can answer to keep them interested. One advantage I've had is that I got to observe an experienced professor teach the same class in the first half of the semester before I had to teach it. That way I was calibrated for the pace and level at which to present. Has everything gone "as planned" or have you been surprised by your experiences so far? No huge surprises. It's a ton of work, but I expected that. It's also incredibly rewarding, which I also expected. Perhaps the biggest surprise is the degree to which I've felt supported and mentored in this first semester, which is really nice. What advice would you give for people who are interested in a position like yours? Any suggestions as to a postdoc path? It's hard, because from my experience, it seemed like the different schools where I interviewed were looking for very different things. Two of the three schools seemed to prefer candidates who had done a visiting professorship (which I had not done), perhaps over a research postdoc. The institution I chose would almost certainly not have hired me without a research postdoc, and I'm convinced a visiting professorship would not have helped me to get this job (and perhaps might have hurt me). That said, I think all primarily undergraduate institutions (PUIs) value teaching experience, so I recommend getting as much as you can. If you want a job at a PUI that does have a research focus, then the next step after grad school is to do a research postdoc. Most PUIs are more restricted in the amount of startup funds they can offer. (From stories I've heard from others, along with my experience, it seems the range is somewhere from $0 - $200K, with the median somewhere a lot closer to zero...) Given this restriction, I think it is also wise to consider what kinds of projects can be done with less funding, and also what avenues of research lend themselves well to being parceled out into small mini-projects suitable for undergraduates to do in a summer or in 4-8 hours per week during the semester. What's your opinion of the job market for people who are interested in positions like yours? What have you heard? CJ again: Thanks to SK for a great interview. And to all the candidates out there, good luck! Good afternoon. Hopefully, you're enjoying the last bit of college football for the year and not thinking about chemical employment. From November 18 until November 25 (inclusive), there have been 110 new positions posted on the ACS Careers website. Of these, 33 (30%) are academically connected and 30 (27%) are from our friends at Kelly Scientific. Not really jobs aplenty, but...: A smattering of postings from various biotechs in Boston and our friends at Vertex. Formulator desired: Central Life Sciences desires a senior formulations chemist for scale-up purposes. The job is located in Dallas, TX. Kelly Time! : Not much to complain about (am I going to have to phase this item out? Oh noes!?! ), but there was a pretty funny posting for an "event planner". It's not about drinks and paper plates; no, this position would involve scheduling surgeries for operating rooms. Oh, yes, this is a position that the American Chemical Society would help me to find. P.S. Ideally, you'd have knowledge of porcine anatomy. Awesome. Award for ad efficiency: Winston-Salem State University has definitely wins an award for efficiency -- a tenure-track position in organic chemistry advertised in 39 words and 8.26 square cm. Small college of the week: Simpson College (Indianola, IA, student population: 1,485 - SA-LUTE!) is looking for an assistant professor of analytical chemistry. Sounds like lots of fun, especially if you like hot air balloons. This is brutal, folks: 2 postdocs and a R&D head position in Laramie, Wyoming do not a recovery make. Faculty positions, though: Still going strong. Small college of the week: The University of New England (Biddeford, ME, student population: 3,167 - SA-LUTE!) is looking for a tenure-track faculty position in inorganic chemistry. I love these descriptions: "a dynamic, enthusiastic individual". So if you're not static and apathetic, this position might be for you. Good luck! Good morning! Including November 13 until November 17, there have been 120 new positions posted on the ACS Careers website. Of these, 36 (30%) are related to academia and fully 75 of them (63%) are from our frenemies at Kelly Scientific. New York, New York: Forest Labs is looking for an experienced M.S. or Ph.D.-level analytical chemist to work in their bioanalytical and drug metabolism department. Is Long Island considered New York City? To the purists, probably not. Or if you'd prefer sun and sand: UC San Diego is also looking for an analytical chemist to work as a staff research associate. "B.S. with lots of experience" or M.S./Ph.D. in analytical chemistry desired. Mostly mass spec work, looks like. Why not make it an-all analytical DPT? : SGS ("the world’s leading inspection, verification, testing and certification company") is looking for a B.S. chemist with 2 to 3 years of petroleum chemistry experience to do GC work in Cape Canaveral, Florida. Bet you'd see a shuttle shot or two. Kelly Time! : Is it me, or are they weeding out the more insulting positions? There's not much to complain about, but again, the American Chemical Society is not where I'd be looking for a "computer systems validation specialist" or a "ATTN! Medical Device Regulatory Affairs Associat [sic]". Little steps, little steps. Good morning! From November 11 until November 12, there have been 27 new positions posted on the ACS Careers website. * Of these, 8 (30%) are academically connected and none are from our friends at Kelly. Surface chemists of the world, unite! : Sud-Chemie (what a name!) is looking for a Ph.D.-level chemist to work on heterogenous catalysis, with an emphasis on fixed-bed reactors. The position is in Palo Alto, CA. We're baaaack! : Savannah River National Laboratory is, once again, looking for people; this position is for radioactive waste management. They're looking for someone relatively experienced (10 years +), but no clear preference as to education level. Double your pleasure? : The Wrigley Company is looking for a experienced PhD-level chemist, for new flavor and taste technologies. How about mint squid-flavored gum? No? Spoilsports. *There's a real possibility of fencepost error in these counts, because the database will often add jobs after the calendar day is over. Good morning! Including November 3 through November 10, there were 126 positions posted on the ACS Careers board. Of those, 34 (27%) are academically related and 68 (54%) are from our friends at Kelly Scientific. It's like being a librarian, only not: BMS is looking for a B.S./M.S. chemist to work in compound management. I'll bet you need to be an organized mind for this. Micronutrients? : Nestle is looking for a PhD food chemist for its micronutrient program. Dunno what that is, but I'll bet it has to do with the label that says "Now, with added antioxidants!" Wax on, wax off: S.C. Johnson is looking for a PhD analytical chemist to work in its Air Care and Pest Control division. Sounds like fun, actually. According to the Bureau of Labor Statistics, U6 unemployment is the "broader" measure of unemployment; that is, it is a measurement of the "[t]otal unemployed, plus all marginally attached workers, plus total employed part time for economic reasons, as a percent of the civilian labor force plus all marginally attached workers." The typical measurement of unemployment is "U3 unemployment", which is a measurement of "[t]otal unemployed, as a percent of the civilian labor force." Friday's BLS report showed that the official unemployment rate is 10.2%. That hurts. What hurts more is that U6 unemployment is 17.5%. What does that mean? It means that more than 1 in 6 people are either unemployed OR working part-time because they can't find a full-time position OR have pretty much quit looking for work because they can't find it, but have knocked around here or there. Friends, this hurts. Still waiting: for a rising trend in industrial jobs... It's up a little, though. Thanks to ExxonMobil for this week's panel ad -- they're looking for a computational chemist. Still strong: Not as many as last week, but the fall hiring season for academic faculty continues apace. I think we're slowing, but it's nice to see positions being posted. Small college of the week: Washburn University (Topeka, KS, student population: 7,300 - SA-LUTE!) is looking for a tenure-track assistant professor of analytical chemistry. You know, everyone says that Kansas is flat, but I've found it pretty. Now Nebraska -- that's flat. Good morning! Including October 28 through November 3, there have been 113 new positions posted on the ACS Careers website. Of these, 37 (33%) are academically connected and 69 are from our friends at KSR. Industrial outlook: Vertex is STILL hiring people in dribs and drabs. Wow. Hmmm: Midwest Research Institute (what DO they do, anyway? something for the government, looks like) is looking for a B.S/M.S. analytical chemist. Too good not to blog: A new university in Bangladesh is popping up: The Asian University for Women. Wow, that's a name. They're looking for new professors. Honk if you want this job: Boise Technologies (located in Boise, ID, natch) is looking for a PhD physical chemist. Kelly Time: It's like it never ends. Are you a chemist? Do you love chemistry? The geniuses at Kelly Scientific Research wish to know if you want to be a clinical statistician, a food engineer (!?!?) or an animal care technician. Sigh. One is the loneliest number: One industrial ad, from Varian. Looks like they're looking for an sales-type in analytical. Your stimulus dollars at work: If you were the National Renewable Energy Laboratory, why in the world would you advertise in C&EN for electrical engineers? Academic positions: Still lots of 'em. Probably on the down slope for this academic year. Small college of the week: Westminster College (New Wilmington, PA, student population: 1,650 - SA-LUTE!) is looking for a tenure-track professor in biochemistry. If you wish to be "within one hour of both Pittsburgh and Cleveland" (emphasis from the ad), this may be for you. Hope you like AFC North football. Job outlook for chemists: grim? The news today is that US GDP rose 3.5% for the 3rd quarter of 2009. Good news, I think, even if most folks are attributing it to the stimulus package. Unfortunately, all the talk is about a "jobless recovery"; for example, the Federal Reserve is worried that the pace of economic "was unlikely to reduce the unemployment rate appreciably." Worse, there's now talk of a "job-loss recovery", where companies continue to shed jobs while growth and/or profits come back. I'm on record thinking that the job outlook for R&D chemists will pick up in late 2010 -- I don't see any reason (other than pique) to change my opinion. Take that one-year master's or take that postdoc and ride this bad boy out. Good morning! There are 236 new positions posted from October 15 until October 27. Of those positions, 68 (29%) are from the academic sector and 121 (51%) are from our friends at Kelly Scientific. Industrial outlook: Not too many huge companies, but Amgen and Vertex make a showing in these past two weeks. Petroleum! : Total is looking for a PhD organometallic chemist for plant support of their resins division. Remember it's not pronounced like the breakfast cereal! That's a fun name: Ashwin-Ushas is looking for a B.S. chemist to do well, a little bit of everything chemistry wise. Looks like they work for a lot of defense contractors -- good to know they need chemists too. "Founded in 2006, Concert is applying deuterium chemistry to develop new drugs. The company treats its 44 employees to breakfast twice a week to give them an opportunity to come in early and socialize with their colleagues. "The intent is to create an environment that is friendly, conducive, collegial, and high performance," founder and CEO Roger Tung says." So inquiring minds want to know -- what's the spread like? Is it bagels and coffee? Or is it an omelet chef and his twenty awesome pans? Comment below or e-mail me at chemjobber -at- gmaildotcom. Millenium? : I never quite know what to think of Millenium's ads in C&EN, especially considering how often they're posted in the pages of C&EN and their online reputation about those ads. Small college of the week: Skidmore College (Saratoga Springs, NY, student population: 2,550, SA-LUTE!) is looking for a visiting assistant professor in biochemistry. "Enthusiasm for teaching and working with undergraduate students in a liberal arts setting is essential." (Too obvious?) On your downtime, you could attend the National College Comedy Festival - hilarious! Where'd you do your postdoc? That's right, baby, you worked for the most famous EEEEVIL tobacco company of them all, Philip Morris. What was your previous experience? "Experience in the high temperature reactions of polysaccharides is essential." What did you do? "The candidate will participate in a research project to study the pyrolysis and combustion of natural occurring polysaccharides and their derivatives." *All snark aside, I swear, if things get desperate enough, I'll be right there with ya, dipping cigarettes into pyrrolidine or whatever to make them taste better. Week to week Index trend: Down, slightly. Um, well: One job posting in the US, another (bigger) ad for a company in China. Big sigh, especially since the company is not even in the traditional Shanghai-area biotech/scientific hotbed. This is getting tough. Academic jobs, though: Tenure-track positions continue to be strong, at all levels. Department of Out-of-Control Acronyms (DoOoCA): The University of South Florida is searching for an assistant professor for the Center for Smart Metal-Organic Materials Advanced Research and Technology Transfer. For the not-so-detailed amongst you, this institution is abbreviated SMMARTT. I am not kidding. Small college of the week: Hendrix College (Conway, AR, student population: 1,350, SA-LUTE!) is looking for a tenure-track assistant professor in organic chemistry. Considering this is the alma mater of chemblogosphere eminence grise Derek Lowe, this week's pick is a no brainer. Breathe easy: The Lovelace Respiratory Research Institute (what a name!) is looking for a research associate to look at particle sizes in aerosols. B.S. or M.S. in chemistry with experience desired. Let me guess, they want a resume: Vitae Pharmaceuticals is looking for fresh organic Ph.D.s to do med-chem with an eye towards metabolic diseases and Alzheimers. Surface chemistry? : A company called Ocean NanoTech wants to hire M.S.-level conjugation chemists with an eye towards bioassay development with quantum dots. Fascinating. Interesting note -- Ocean NanoTech is located in Arkansas. So it's a figurative ocean. Kelly Time! : It's like it never ends: Do you like chemistry? Do you want to be a chemist? The brilliant people at Kelly Scientific wish to know if you want to be a food safety manager, a sanitation manager, an animal caretaker or an ATTN! Medical Device Regulatory Affairs Associate. I swear, these people couldn't be dumber if they tried. 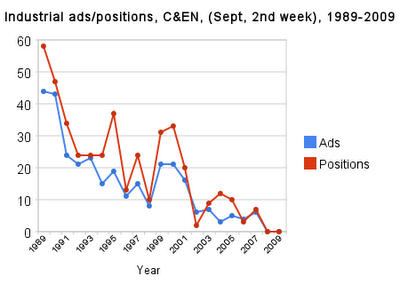 Academic positions still going strong: Lots of tenure-track positions, at all levels. Small college of the week: Rhodes College (Memphis, TN, student population: 1,664, SA-LUTE!) is looking for a tenure-track assistant professor position in Organic Chemistry. Pretty cool... especially if you like barbecue! Letters reacting to Jyllian Kemsley's article on the UCLA tragedy of research assistant Sheharbano "Sheri" Sangji have been posted on C&EN Online. (I really appreciate the fact that C&EN has posted more letters online than they were able to print. Way to go, guys.) More on the letters substantively, later. What's the difference? Not much, really, except for one word: Harran. UPDATE: C&EN Editor-in-Chief Rudy Baum comments below: "C&EN ran ALL of the letters it received on Jyllian Kemsley's coverage of the accident at UCLA, either in print or online. Harran's name is not prominent in the word cloud because almost none of the letters mentioned him." In the comments below, I stated my opinion that the lack of Harran's name in the letters was a choice on the part of the editors. My opinion was clearly not correct. Apologies to C&EN and the editorial staff. Morning, folks! Including September 26, there have been 209 new jobs posted on the ACS Careers database. Of those, 106 (51%) are from our friends at KSR. Also, 51 positions (24%) are either postdocs or faculty positions in academia. Chemist wanted for law firm: Want to work for an international law firm? Keller and Heckman are looking for a chemist for a non-bench position; graduate degree preferred, with experience in plastics. Biomarker discovery: RTI International is looking for a research chemist (BS/MS with experience) to do mass spectrometry for animal studies. Sounds like fun. From the future: E-Paper Inc. is looking for chemists (5 positions!) to work on their display screen technology. "Sunny California", the ad says! M.S. or Ph.D. preferred. Kelly Time! : Same song, different week: Do you like chemistry? Have you always wanted to be a chemist? Kelly Scientific Resources is asking you this week, if you would like to be an "Analista Estadastico", a fungal microbiologist, an animal study director or a veterinarian. Do these people read?!?! Week to week trend: Up, slight. What's your title again? : Novartis is looking for a "Scientific Education Manager" for both Cambridge and Basel. Your job, should you choose to accept it, would be to "catalyze a collaborative culture of learning and training that fosters scientific innovation and interdisciplinary research... [and] to evaluate and develop scientific learning opportunities for NIBR employees at all levels." Fascinating. While I was initially confused by it, it actually sounds like a cool position. Good luck out there. Still going strong: Lots of universities hiring, including R1 schools. Good luck to the ~200 or so postdocs who actually have a shot at these positions. Small college of the week: Presbyterian College (Clinton, SC, student population 1300, SA-LUTE!) is looking for a tenure-track professor in biochemistry. If you wish to teach at a school that has the largest bronze statue of a Scotsman in the world, this position may be for you! Safety officers of the world, cringe! 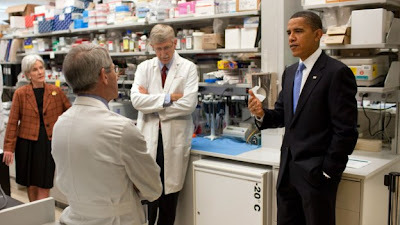 What kind of message would it send to the bench scientists of America if the President had donned a pair of safety glasses and a specially embroidered Presidential lab coat? * Now that would be change I can believe in. Competition against C&EN: 1989 is before the internet - I'm going to guess that it was the only game in town, if you wanted to hire chemists. Nowadays, it's one of at least 5 or 6 places to go -- besides, who wants to pay for ads on-dead-tree when you could pay much less for ads online? Recruiters moving their schedules: It's completely possible that companies have, over the years, quit advertising for positions during the 2nd week of September and they're putting their ads in C&EN some other time. The golden years are over: Perhaps this is evidence of a "secular trend", as the economists would put it, where the job market for chemists is just never going to be as good as it ever was. Sad, if true. I'm sure there are alternate explanations; readers, you're welcome to comment on them. But nevertheless, the current paucity of industrial job ads and positions is hitting chemists hard. Week to week trend: Flat. Week to week trend: Stable. Tenure-track, however...: Again, lots of new tenure-track positions. Good luck out there. Good morning! Including September 16, there have been 188 new positions posted on the ACS Careers website. Of those, 26 (14%) are faculty positions and 119 (63%) are from our friends at KSR. The middle aisles smell so fresh! : Want to make processed foods that will make the health nuts scream and mouths water? International Flavors and Fragrances needs B.S./M.S. chemists in their flavor/fragrance delivery research teams. Great name: Smooth-On needs a senior polymer chemist; they would like a B.S. chemist with at least 7 years experience. Gas card no longer needed? : Exxon-Mobil is looking for a fuels researcher; they would like someone who has a fuel chemistry speciality and preferably a Ph.D. in chemistry or chemical engineering. Postdoc at the aquarium: Sounds like an album name, doesn't it? Monterey Bay Aquarium Research Institute has postdoctoral fellowships open. 'Twould be a lovely place to do a postdoc, wouldn't it? Kelly Time! : All together now: are you a chemist? Do you like doing chemistry? The geniuses at Kelly Scientific Research would like to know if you can do the following things: be a biostatistician, a "skill [sic] marketing job" with a Ph.D. in plant ecophysiology, a clinical psychologist or a coding nurse. Good luck! Where are the jobs for his friends now? On the other hand...: Plenty of faculty positions to apply for, with 31 faculty positions. Small college of the week: The University of Wisconsin - Oshkosh (Oshkosh, WI, student population: 12,669, SA-LUTE!) is looking for a tenure track assistant professor position in analytical position. Doyle Redland (of Onion fame) is a (fake) alumnus, if that's a plus for you. Week to week trend: Not applicable. Piddling: Looking for an industry job? Unless you're heading to South Korea or you want to postdoc, no dice. Big week for faculty positions: Over 70 tenure-track faculty positions. I think I'll have a more detailed roundup later this week, but it's pretty huge. As I recall, this is the "academic recruiting" issue; nice to see that there's something out there. Small college of the week: The University of Toronto - Mississauga (Mississauga, Toronto, Canada - student population: 8762) is looking for a Lecturer in Analytical Chemistry. If you want to watch the Toronto Argonauts practice (this is the site of their practice facility) in your off hours, this position might be for you!